This installment of the Knowledge Check-series clocks in at 14 pages, 1 page front cover, 1 page editorial, 1 page ToC, 2 pages of advertisement, leaving us with 9 pages of content, so let’s take a look! So, this is something different. As you all may know, I’m a bit obsessed with languages and sociolects – I’ve been pretty vocal in my love of the inclusion of slang in Fat Goblin Games’ PWYW Carnival of Sinners. 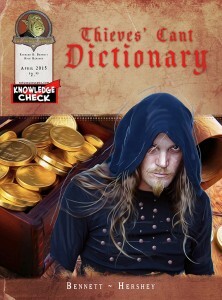 This inexpensive book provides essentially a number of words you can use to make your underworld feel more unique. While some of the words are pretty obvious (“bene” meaning “good”, for example), there are quite a few intriguing slang words herein: A “Holy Lamb” is, for example, a thoroughly despicable villain; “Jibber the Kibber” is the practice of using a horse and a lantern to make ships run aground. Oh, and “lacing” something means to beat someone. While some words herein are simply that, others inspire regarding the practice to which they refer: “leggers” e.g. sell low-quality goods, purportedly smuggled goods, and thus avoid repercussions for the bad quality of their merchandise. Knowing about “Hangman’s Wages” may also prove useful within the consistency of your game-world. Editing and formatting are top-notch, I noticed no glitches. Layout adheres to an easy-to-read, beautiful 2-column full-color standard and the pdf comes fully bookmarked for your convenience. Artwork is sparse, but fitting. Richard D. Bennett provides a damn cool little dictionary here – the practices and words herein can inspire and certainly help you make your depictions of the seedy underbelly of your campaign more exciting. What’s here, is certainly awesome, particularly for the low price point. At the same time, I really wished this was longer and that it had some invented, new fluff to account for the different reality of most fantasy settings – words for halflings, goblins, magic and sorcerous pursuits would have been much appreciated, at least by me. What we do get here is a nice glimpse at real world thieves’ cant for a low price and as such, this is a nice book – my final verdict hence will clock in at 4 stars. You can get this nice, inexpensive pdf here on OBS and here on d20pfsrd.com’s shop!